Tamil movies :Captain scared of Pulan visaranai? Pulan visaranai was a super duper hit and created a new screen persona for Vijayakanth. The Honest Raj character led to a series of upright cop roles for him. He also veered towards message oriented films which became hits. Now, Pulan visaranai Part II has been launched but Vijayakanth is not playing the lead. We put out our antennae to find out why. Ibrahim Rowther was the producer of the original. He had launched about five films a couple of years ago. These were all well publicized. But the films did not take off. Meanwhile, he had borrowed huge sums for these projects. But, now having announced the sequel to Pulan visaranai, those who had financed earlier were pressing him for money. 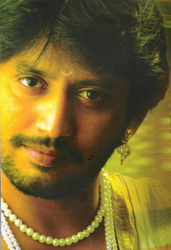 Therefore, Captain had been reluctant to associate himself with the sequel fearing a repeat of the Perarasu fiasco.